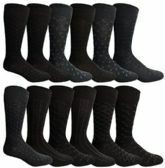 Ike Behar Men's Designer Glitter Dress Socks, Tuxedo Socks , Fits Shoe Sizes 7-12 Black Black Silver Sparkle at low wholesale prices. 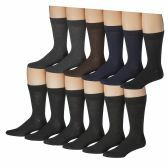 Socksinbulk.com offers Mens Dress Sock at bulk discounted prices. DIAL UP YOUR BOLD: Dress to impress from head to toe with the perfect pair of designer glitter socks from Ike Behar for Men. Whether out on the town, at home, or in the office, put on some colorful men’s dress socks to ensure your steps will indeed be bold. Dial up your bold with a pair of our fashionable and fun men’s dress socks. QUINTESSENTIAL ACCESSORY: Kick up your sock game with Ike Behar's glitter sock fashion trend. The days when sock drawers were filled with nothing but white tube socks are over. This mid-calf style is perfect with sneakers, loafers, dress shoes, boots and everything in between. FABRICATION: Soft and stretchy with glitter contrast, these socks offer comfort and style that gets you through the night. Crafted from 75% cotton, 10% lurex, 10% polyester and 5% spandex for the perfect blend of fabric for your feet. COLOR CHOICES: With a plethora of color options from simple and stoic, to bold and vivacious, our collection matches every sense of style. Dress to impress from head to toe with the perfect pair of designer glitter socks from Ike Behar for Men. 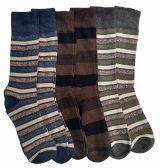 Soft and stretchy with glitter contrast, these socks offer comfort and style that gets you through the night. Whether out on the town, at home, or in the office, put on some colorful men’s dress socks to ensure your steps will indeed be bold. Dial up your bold with a pair of our fashionable and fun men’s dress socks.